Dyeing is the process of recoloring armor using dye. All dyes are craftable and can be removed using a Dye Remover, which will restore the armor to its default coloring. To use dye pick it up and right-click on the item. If the item is dyeable it will change colour appropriately, both on the inventory icon and in game. Note: This technical section pertains to modding! An example of how clothing is saved internally (left), how it is viewed in-game (centre), and how it is viewed when dyed red (right). Note how the shoes stay the same colour throughout all three pictures. A dye works as an augment, applying a permanent status to a specified item when used. 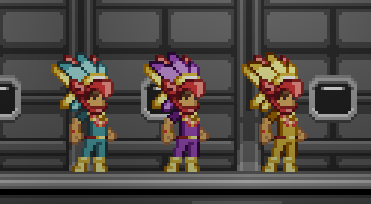 However, the dyes themselves to not recolour the item. Instead, the item itself has a section of code in their ".head", ".legs", ".chest", or ".back" JSON file, which tells the game what colour pixels to replace with other colours when the dye is applied. When a dye such as, for example, Red Dye is applied to an item, these hexidecimal colour values are replaced with other hexidecimal colour values. What colour replaces the default tans and browns are defined in the item file itself. Any colour not defined in said file will not be recoloured. This page was last modified on 21 April 2018, at 03:33.